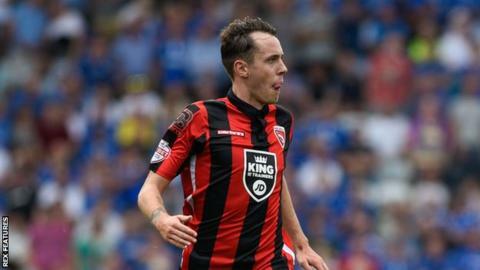 Jamie Devitt's stunning goal helped earn Morecambe a draw against already relegated York. Luke Summerfield gave the visitors the lead in first-half stoppage time with a brilliant driven effort. Shortly after the break, Devitt ferociously struck a dipping shot into the top corner to level proceedings. As both sides pushed for a winner, York goalkeeper Michael Ingham proved the hero as he magnificently saved Paul Mullin's strike. The draw meant Morecambe finished the season 21st in League Two, while York ended up bottom of the Football League. York City manager Jackie McNamara told BBC Radio York: "I think that match summed up our season, with the amount of chances we had and some of our decision making. "We were given opportunities to score. Some things were pleasing. Some things weren't. We could have scored another three or four goals at least. It's disappointing not to win it." Match ends, Morecambe 1, York City 1. Second Half ends, Morecambe 1, York City 1. Corner, Morecambe. Conceded by Michael Ingham. Attempt saved. Paul Mullin (Morecambe) right footed shot from the left side of the box is saved in the top right corner. Attempt missed. Aaron Wildig (Morecambe) header from the centre of the box is high and wide to the right. Attempt missed. Paul Mullin (Morecambe) right footed shot from the centre of the box is high and wide to the left. Attempt missed. Jamie Devitt (Morecambe) right footed shot from outside the box misses to the right. Attempt missed. Cole Stockton (Morecambe) right footed shot from outside the box is close, but misses to the left. Corner, York City. Conceded by Aaron McGowan. Attempt missed. Paul Mullin (Morecambe) right footed shot from the left side of the box is close, but misses to the right. Substitution, Morecambe. Cole Stockton replaces Alan Goodall. Attempt missed. Vadaine Oliver (York City) right footed shot from the left side of the six yard box is close, but misses to the left. Attempt missed. Kenneth McEvoy (York City) left footed shot from very close range is close, but misses to the right. Substitution, York City. Vadaine Oliver replaces Bradley Fewster. Attempt missed. Josh Carson (York City) header from very close range is close, but misses to the left. Attempt blocked. Bradley Fewster (York City) right footed shot from very close range is blocked. Corner, Morecambe. Conceded by Dave Winfield. Foul by Lewis Alessandra (York City). Attempt missed. Jamie Devitt (Morecambe) right footed shot from outside the box is just a bit too high. Attempt saved. Alan Goodall (Morecambe) right footed shot from outside the box is saved in the centre of the goal. Corner, Morecambe. Conceded by Kyle Cameron. Substitution, Morecambe. Ryan Edwards replaces Adam Dugdale. Attempt missed. Lewis Alessandra (York City) right footed shot from the left side of the box is close, but misses to the left. Attempt saved. Aaron Wildig (Morecambe) left footed shot from the left side of the six yard box is saved in the bottom right corner. Goal! Morecambe 1, York City 1. Jamie Devitt (Morecambe) right footed shot from outside the box to the top left corner.